In 2017, researchers working in the Ecuadorian Andes stumbled across a previously unknown species of hummingbird—but as documented in a new study published in The Auk: Ornithological Advances, its small range, specialized habitat, and threats from human activity mean the newly described Blue-throated Hillstar is likely already critically endangered. Hillstars are unusual among hummingbirds—they live in high-elevation habitats in the Andes and have special adaptations to cold temperatures. Francisco Sornoza of Ecuador's Instituto Nacional de Biodiversida, first observed and photographed a previously unknown hillstar during fieldwork in southwest Ecuador in April 2017. After this first expedition, Francisco engaged fellow researchers Juan Freile, Elisa Bonaccorso, Jonas Nilsson, and Niels Krabbe in the study of this possible new species, returning in May to capture specimens and confirm the finding. They dubbed the new species Oreotrochilus cyanolaemus, or the Blue-throated Hillstar, for its iridescent blue throat. The Blue-throated Hillstar is found only along bush-lined creeks in an area of about 100 square kilometers, and the researchers estimate there are no more than 750 individuals, perhaps fewer than 500. Threats to its habitat include fire, grazing, and gold mining, and it meets the criteria to be considered critically endangered. "Complete support from national and international conservation agencies is needed in order to save this species," says coauthor Francisco Sornoza-Molina. "The action plan for the conservation of this bird is creating a network of protected areas along its geographic range." "The hillstar hummingbirds occur in the most rugged, isolated, and inaccessible parts of the Andes, where they roost in caves, forage on the ground, and spend half their lives in hypothermic torpor, so the discovery of a new species in this group is incredibly exciting. 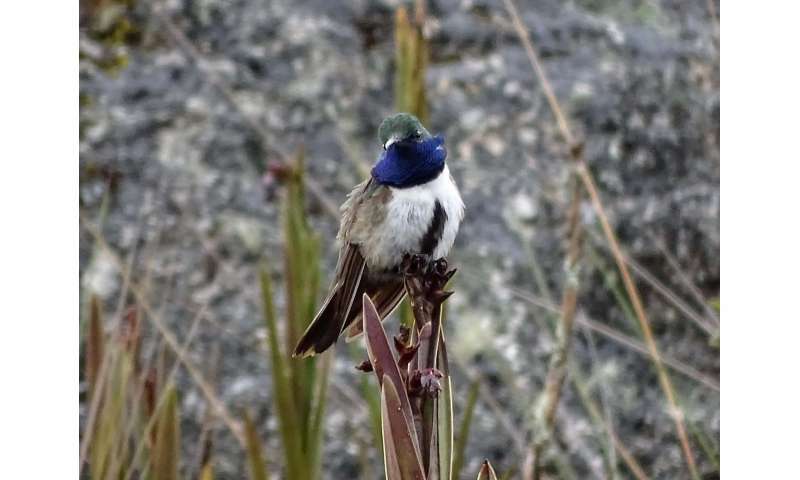 This striking discovery confirms that life in the high Andes still holds many secrets to be revealed," according to the University of New Mexico's Christopher Witt, a hummingbird expert who wasn't involved in the study. "The location is fitting for a new species of hillstar, because it's a remote, high mountain range that is isolated and is sandwiched between the ranges of two other hillstar species. The authors did a thorough job comparing the new form to its relatives in every respect."